We present INDUS (Intelligent Data Understanding System), a federated, query-centric system for knowledge acquisition from autonomous, distributed, semantically heterogeneous data sources that can be viewed (conceptually) as tables. INDUS employs ontologies and inter-ontology mappings, to enable a user or an application to view a collection of such data sources (regardless of location, internal structure and query interfaces) as though they were a collection of tables structured according to an ontology supplied by the user. This allows INDUS to answer user queries against distributed, semantically heterogeneous data sources without the need for a centralized data warehouse or a common global ontology. We used INDUS framework to design algorithms for learning probabilistic models (e.g., Naive Bayes models) for predicting GO functional classification of a protein based on training sequences that are distributed among SWISSPROT and MIPS data sources. Mappings such as EC2GO and MIPS2GO were used to resolve the semantic differences between these data sources when answering queries posed by the learning algorithms. 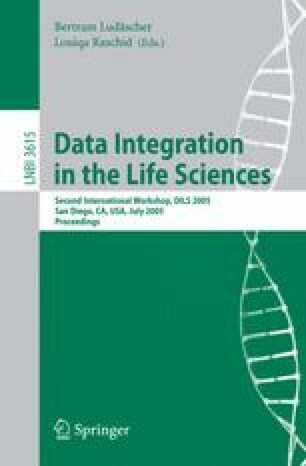 Our results show that INDUS can be successfully used for integrative analysis of data from multiple sources needed for collaborative discovery in computational biology.